Let's take a look at some replay numbers from 2017 with tmac's Replay Review stats. It is hard to fathom after 1336 reviews, that we nearly split 50-50 on outcomes: 671 were upheld and 665 were overturned (50.2% upheld vs 49.8% overturned). 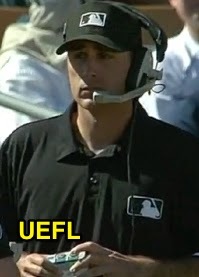 Link: UEFL's Replay Review Statistics & Sabermetrics page. With apologies to Dale Scott, who statistically was the only "Perfect Replay" umpire in 2017 (all of his reviewed calls were upheld via Replay), we removed him from the analysis since, due to his season-ending concussion injury in April, he only worked approximately two weeks of the season, and only saw two of his calls go to New York (though, again, both were affirmed). Thus, we turn to Pat Hoberg, who, in his first year as a full-time umpire, had only one overturn. Sometimes the whackers don't find you. For a full-timer, Hoberg was fairly invisible this season—he flew so under the radar, I thought he was injured (even though he wasn't). He was challenged over a span of three months just once and only eight times on the year: that's a Review Affirmation Percentage (RAP) of .875, a mark which only minor league call-up umpire Ryan Blakney matched (Blakney was also 7-of-8 in Replays). Chad Fairchild also had a very quiet and very good year with only two overturns. 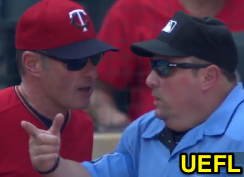 Speaking of "good," there are two predominant lines of thinking when it comes to umpires and Replay Review stats. The first posits that the highest RAP-bearer is the best Replay umpire: he who fares best on review is king. The second holds that the fewest number of overturned calls determines superiority: he whose calls are correct to begin with avoids Replay Review altogether because managers won't challenge such quality rulings. 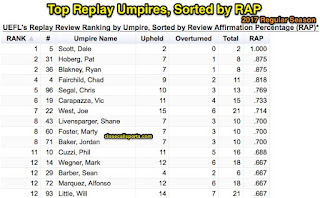 The 2017 regular season's Top Replay Umpires. Regardless of which philosophy you subscribe to, the best RAP umpires were 1) Scott, 2) Hoberg, 2) Blakney and 4) Fairchild. Meanwhile, the umpires with the least number of overturned calls were 1) Scott, 2) Hoberg, 2) Blakney, and 4) Fairchild. 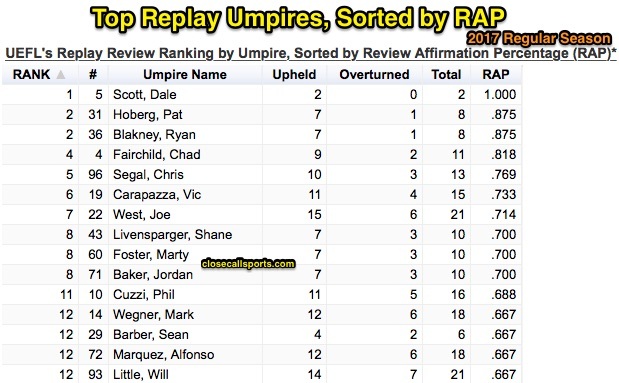 The only other umpire with just two overturned calls was fill-in umpire Sean Barber, whose RAP was .667 (T-12th), while fellow fill-in Chris Segal had three overturned calls to his 10 affirmed (.769 RAP, 5th). It's very clear who DESERVES to be amongst the next few hires, but as we know in the umpiring world what's right and what happens do not always go hand in hand. Three other members of the full-time staff had three overturns. One of those umpires—you may be surprised to know—is Marty Foster. Foster has very quietly turned himself into a very good base umpire. The other full-timers with three overturns are Jordan Baker and Hunter Wendlestedt (excluding the reduced-schedule-working Mike DiMuro). Jeff Kellogg, Vic Carapazza and Scott Barry are next closest with 4 OTs on the year. Greg Gibson was challenged 29 times to lead all umpires, and was overturned 12 times (.586 RAP, 28th in the league). Ever present, Joe West was subject to replay more often and had the most overturned calls of any umpire whose RAP was in the Top 10 in the league: West was overturned six times and affirmed 15 times (21 total replays) for a RAP of .714, landing Cowboy Joe seventh best in the bigs (and the highest ranked crew chief not named Dale Scott). Larry Vanover leads the way with 18 overturned calls which is by far the most for any crew chief this season, much less any umpire in general. Sam Holbrook is next closest crew chief, with 12 overturned calls. Chris Conroy is the next closest full-time member with 12. Several call-up umpires also had double figure overturns, including Chad Whitson (13), Tom Woodring (12), Clint Fagan (11), and Stu Scheurwater (10). I really can't wait for this year's UEFL Umpire of the Year. There are some great candidates. Over the past two seasons, Jeff Kellogg has been overturned seven times; that is a remarkable number. Who do you think had the best season? Also don't forget to join us here at CCS for our daily Playoff Blog unlike any other. If you can give us a like on Facebook we'd be grateful; we're nearing 3200 likes at https://www.facebook.com/UmpireEjections. Also, follow us on Twitter for all the latest news. Help us get to 2500 followers, over at https://twitter.com/UmpireEjections. Tell your friends!! Like a call? Hate a call? Have a question let us know!! And let the playoffs begin!! Full Replay stats are available on the site here: http://www.closecallsports.com/p/replay-stats.html.